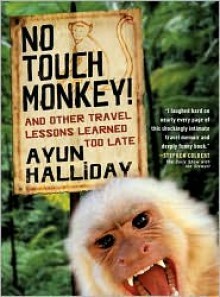 Ayun Halliday may not make for the most sensible travel companion, but she is certainly one of the zaniest, with a knack for inserting herself (and her unwitting cohorts) into bizarre situations around the globe. Curator of kitsch and unabashed aficionada of pop culture, Halliday offers bemused, self-deprecating narration of events from guerilla theater in Romania to drug-induced Apocalypse Now reenactments in Vietnam to a perhaps more surreal collagen-implant demonstration at a Paris fashion show emceed by Lauren Bacall. From taming the wild dog packs of Bali to requiring the services of a bonesetter in Sumatra, Ayun Halliday offers up the best of her itinerant foibles as examples of how not to travel abroad. For instance, on layover in Amsterdam, Halliday finds unlikely trouble in the red-light districteliciting the ire of a tiny, violent madam,and is forced to explain tampons, which she admits, “might have looked like white cotton bullets lined up in their box,” to soldiers in Kashmir“They’re for ladies. Bleeding ladies.” A self-admittedly bumbling vacationer, Halliday shareswith razorsharp wit and to hilarious effectthe travel stories most are too self-conscious to tell. It's funny enough but just didn't appeal to me that much. Read it mainly for the monkey forrest part.